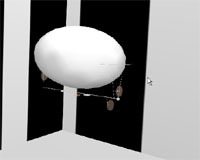 Applying bio-inspired methods to indoor flying robots for autonomous vision-based navigation. Robotic vision opens the question of how to use efficiently and in real time the large amount of information gathered through the receptors. The mainstream approach to computer vision based on a sequence of pre-processing, segmentation, object extraction, and pattern recognition of each single image is not viable for behavioral systems that must respond very quickly in their environments. Behavioral and energetic autonomy will benefit from light-weight vision systems tuned to simple features of the environment. In this project, we explore an approach whereby robust vision-based behaviors emerge out of the coordination of several visuo-motor components that can directly link simple visual features to motor commands. Biological inspiration is taken from insect vision and evolutionary algorithms are used to evolve efficient neural networks. The resulting controllers select, develop, and exploit visuo-motor components that are tailored to the information relevant for the particular environment, robot morphology, and behavior. The story started with a non-flying robot. Floreano et al. 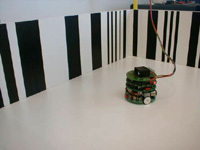 (2001) demonstrated the ability of an evolved spiking neural network to control a Khepera for smooth vision-based wandering in an arena with randomly sized black and white patterns on the walls. The best individuals were capable of moving forward and avoiding walls very reliably. However, the complexity of the dynamics of this terrestrial robot is much simpler than that of flying devices, and we are currently exploring whether that approach can be extended to flying robots. The Khepera equipped with one of the best evolved neural network has been running in an exposition at the Villa-Reuge during 8 months. Evolving aerial robots brings a new set of challenges. The major issues of developing (evolving, e.g. using goevo) a control system for an airship, with respect to a wheeled robot, are (1) the extension to three dimensions, (2) the impossibility to communicate to a computer via cables, (3) the difficulty of defining and measuring performance, and (4) the more complex dynamics. For example, while the Khepera is controlled in speed, the blimp is controlled in thrust (speed derivative) and can slip sideways. Moreover, inertial and aerodynamic forces play a major role. Artificial evolution is a promising method to automatically develop control systems for complex robots, but it requires machines that are capable of moving for long periods of time without human intervention and withstanding shocks. 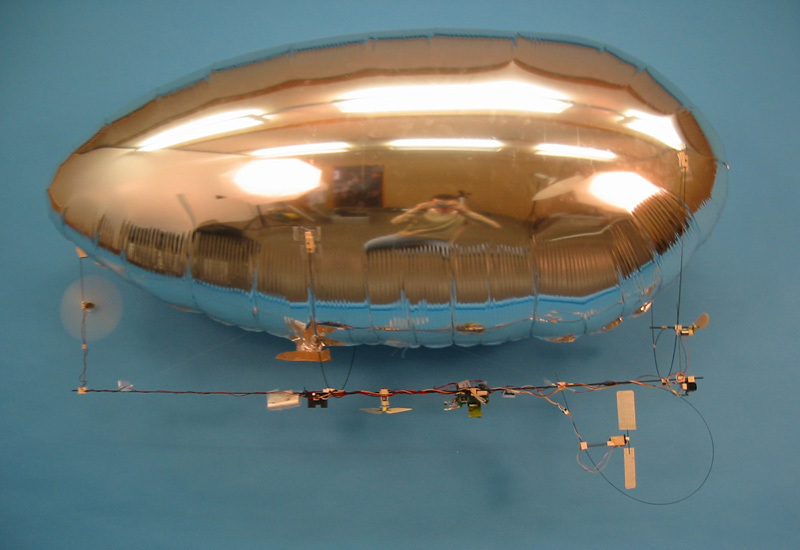 Those requirements led us to the development of the Blimp 2 shown in the pictures. All onboard electronic components are connected to a microcontroller with a wireless connection to a desktop computer. The bidirectional digital communication with the desktop computer is handled by a Bluetooth radio module, allowing more than 15 m range. The energy is provided by a Li-Poly battery, which lasts more than 3 hours under normal operation, during evolutionary runs with goevo. For now, a simple linear camera is attached in front of the gondola, pointing forward. We are currently working on other kinds of micro-cameras. Other embedded sensors are an anemometer for fitness evaluation, a MEMS gyro for yaw rotation speed estimate, and a distance sensors for altitude measurements. In order to further demonstrate this concept, we chose the indoor slow flyers as a well-suited test-bed because of the need for very fast reactions, low power consumption, and extremely lightweight equipment. The possibility of flying indoor simplifies the experiments by avoiding the effect of the wind and the dependence on the weather and allows for modifying as needed the visual environment. Our new model F2 (picture on the left) has the following characteristics: bi-directional digital communication using Bluetooth, overall weight of 30 g, 80 cm wing span, more than 20 minutes autonomy, 1.1 m/s minimum flight speed, minimum space for flying of about 7x7 meters, 2 or 3 linear cameras, 1 gyro, 1 2-axis accelerometer). With respect to the Blimp, that kind of airplanes are slightly faster and have 2 more degrees of freedom (pitch and roll). Moreover, they are not able to be evolved in a room. 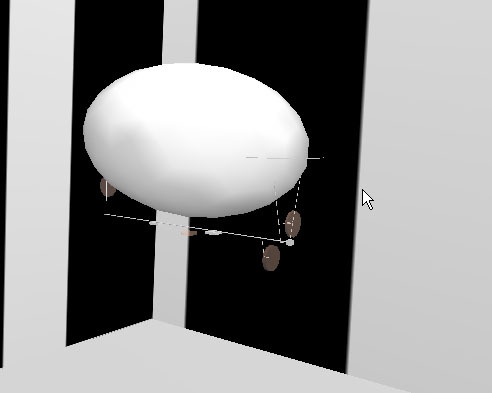 Therefore are we currently working on a robotic flight simulator (see below). Both physical and simulated indoor slow flyers are compatible with goevo. 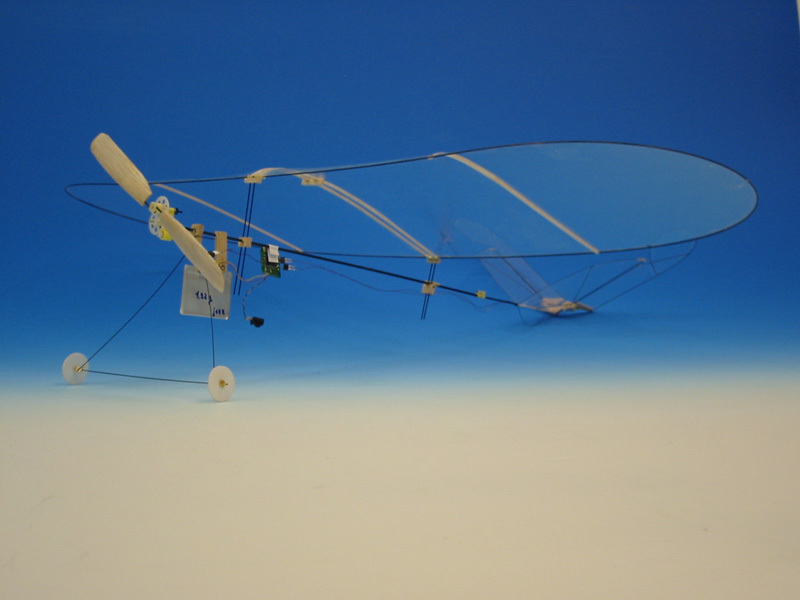 **Initial experiments using optic-flow without evolutionary methods have been carried out to demonstrate vision-based obstacle avoidance with a 30-gram airplane flying at about 2m/s (model F2, see pictures on the left). The experimental environment is a 16x16m arena equipped with textured walls. The behavior of the plane is inspired from that of flies (see Tammero and Dickinson, The Journal of Experimental Biology 205, pp. 327-343, 2002). The ultra-light aircraft flies mainly in straight motion while using gyroscopic information to counteract small perturbations and keep its heading. Whenever frontal optic-flow expansion exceeds a fixed threshold it engages a saccade (quick turning action), which consists in a predefined series of motor commands in order to quickly turn away from the obstacle (see video below). The direction (left or right) of the saccade is chosen such to turn away from the side experiencing higher optic-flow (corresponding to closer objects). Two horizontal linear cameras are mounted on the wing leading edge in order to feed the optic-flow estimation algorithm running in the embedded 8-bit microcontroller. The heading control including obstacle avoidance is thus truly autonomous, while an operator only controls the altitude (pitch) of the airplane via a joystick and a Bluetooth communication link. So far, the 30-gram robot has been able to fly collision-free for more than 4 minutes without any intervention regarding its heading. Only 20% of the time was engaged in saccades, which indicates that the plane flew always in straight trajectories except when very close to the walls. During those 4 minutes, the aerial robot generated 50 saccades, and covered about 300m in straight motion. Seethis poster for more information. A flight simulator based on Webots4 helps us to speed up evolutionary runs and rapidly (up to 10x faster) test new ideas. Using OpenGL and ODE (Open Dynamics Engine), Webots4 is able to accurately simulate 3D motion with physical effects like gravity, inertia, shocks, friction. Our blimp dynamical model includes buoyancy, drag, Coriolis and added mass effects (cf. Webots official distribution for a simplified example of this model). So far, we were able to demonstrate very good behavioral correspondence between simulated Blimp 2b and its physical counterpart (see movies below) when evolved with goevo. At the moment of writing, a simple model of our indoor slow flyer is under development. Our plan is to have evolution taking place in simulation and the best-evolved controllers being used to form a small population to be incrementally evolved on the physical airplane with human assistance in case of imminent collision. However, we anticipate that evolved neural controllers will not transfer very well because the difference between a simulated flyer and a physical one is likely to be quite large. This issue will probably be approached by evolving hebbian-like synaptic plasticity, which we have shown to support fast self-adaptation to changing environments (cf. Urzelai and Floreano, 2000). The list of related project links is maintained up to date on this follow-up project webpage. DR. CNRS Franceschini, Prof. Siegwart and Prof. Nicoud are member of the thesis comitee. Cyril Halter has been strongly involved in the development of the indoor slow flyers, especially for the aerodynamics and the building of the prototypes. Dr. Jörg Kramer and Dr. Shih-Chii Liu (INI) for the design of aVLSI vision chips. André Guignard helped with several micro-mechanical realizations. More recent news can be found on this follow-up project webpage. [15 Nov 2006] Jean-Christophe Zufferey receives the ABB award with the EPFL-Press mention for his PhD thesis on bio-inspired vision-based flying robots. [4 March 2005] Public defense of the thesis entitled "Bio-inspired Vision-based Flying Robots" at 17:15 in the Polydôme. The presentation will be followed by a micro indoor airshow during the aperitif. [25 August 2004] Our latest results with the 30-gram indoor aircraft capable of autonomous steering have been presented at the "Insect Sensors and Robotic" conference in Brisbane, Australia. Our poster won one of the three best poster awards. The new 6-gram remote-controlled model from DIDEL has also been demonstrated in flight. [18 August 2004] New video clips of the 30-gram model F2 in autonomous steering experiments. 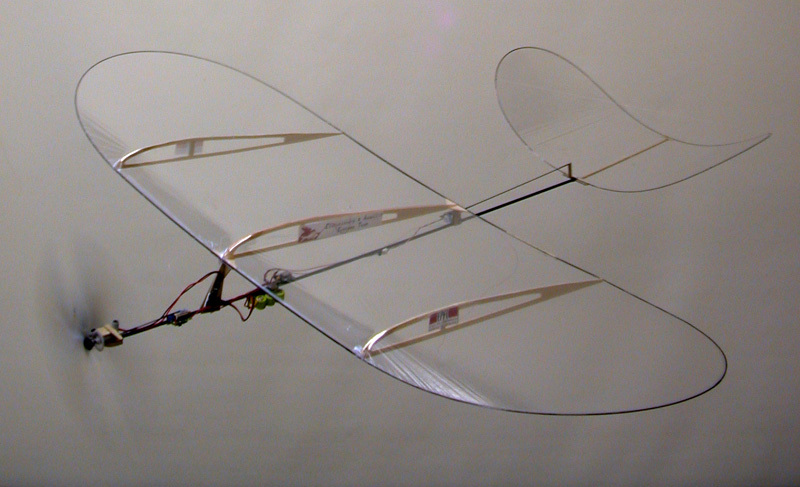 [9 July 2004] First successful frontal optic-flow-based obstacle avoidance with the new F2 indoor slow flyer (30g). [24 November 2003] Start day of the new "TP de Robotique" for EPFL students: "Bio-inspired vision for autonomous robotic navigation: the fly eye". [10 October 2003] Opening of the Evolutionary Robotics Open Soft and Hardware Framework. 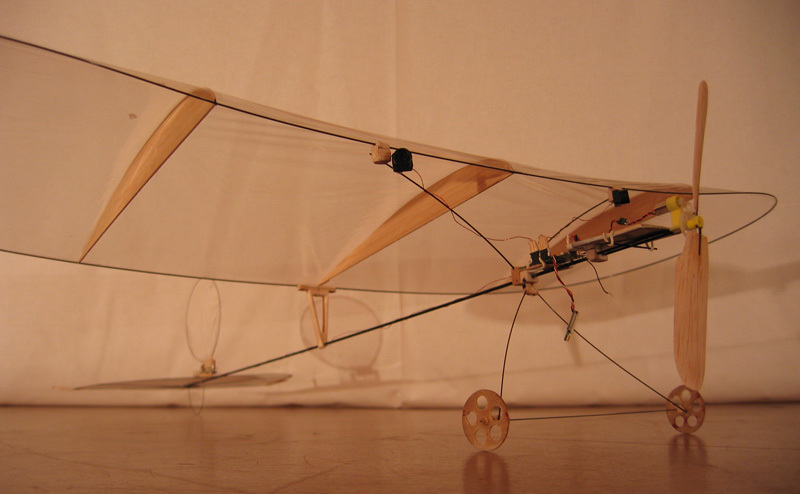 [January 2003] First flights of a custom made (by DIDEL) less than 10 g airplane. See the photo and some comments. [15 May 2001] Start day of the Slow Flyers Initiative at EPFL. More recent participation in conferences can be found on this follow-up project webpage. [26 January 2005] Conférence "Trucmouche - Objets volants bio-inspirés" à Neuchatel, organisée par hept.aero. [23-26 August 2004] Insect Sensors and Robotics conference in Brisbane, Australia. Our poster won one of the three best poster awards. [4-5 December 2003] Presentation of a poster "From Wheels to Wings: Evolving Neural Networks for Vision-based Navigation" at the TAUC 2003 conference. [30 October 2003] Presentation of the paper "Vision-based Navigation from Wheels to Wings" at IROS'03, in Bally's Las Vegas Hotel. 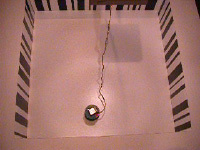 [1 October 2003] Presentation of this project: "Evolution de circuits neuronaux pour le contrôle de robots volants basé sur la vision" and demonstration of the 10g slow flyer "celine" at the Journées Microdrone 2003. 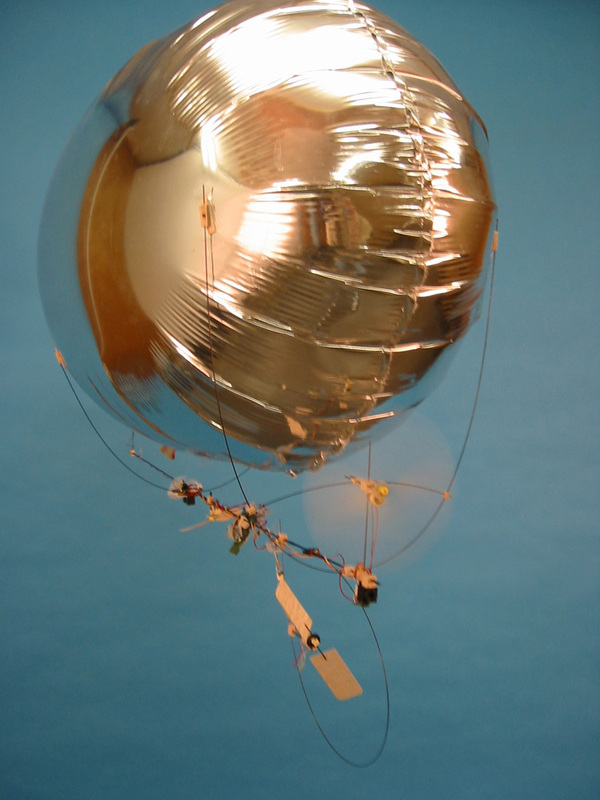 [November 2002] Presentation of the paper "Evolving Vision-based Flying Robots" at BMCV'02, Max Plank Institute for Biological Cybernetics, Tübingen. 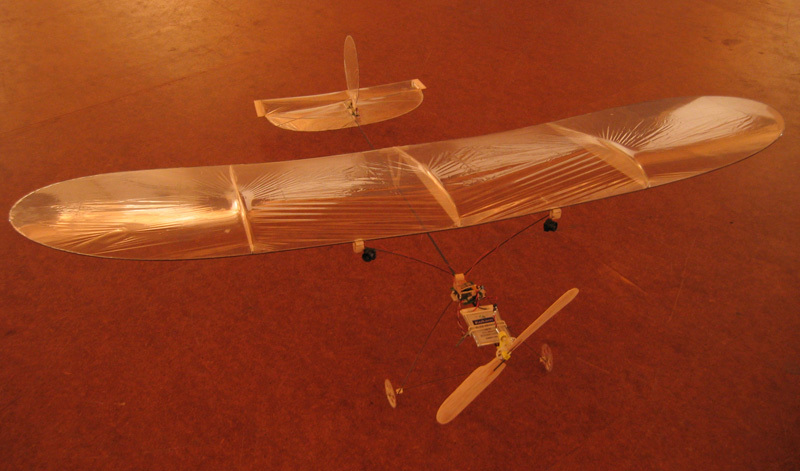 [October 2002] Presentation of this project within the Workshop on Aerial Robotics and presentation of a paper "Toward Indoor Flying Robots" at IROS'02, EPFL, Lausanne. More recent event anouncements can be found on this follow-up project webpage. 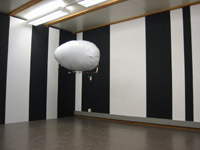 [19 March - 19 June 2005] Exhibition of our artificially evolved Blimp at Musée Jenisch in Vevey, Switzerland. [14 February 2005] Prof. Srinivasan gives a talk at EPFL about honeybee vision, navigation, "cognition" and applications to autonomous vehicules. 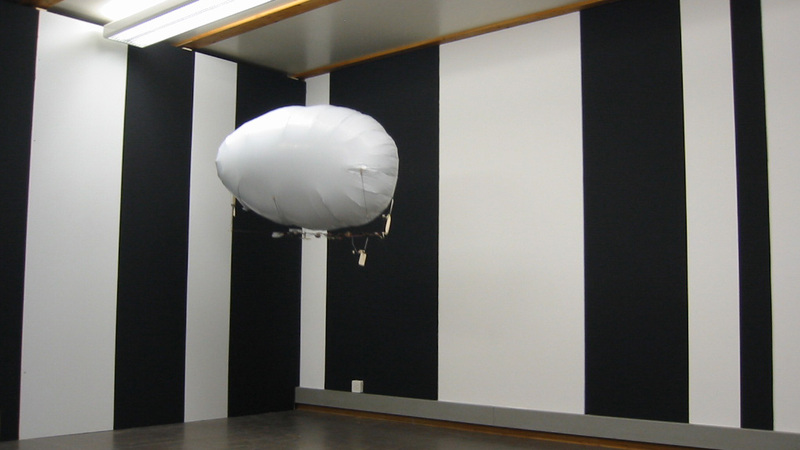 [October 2004] We are technical partner for an artistic exhibition with blimps by knowbotic research. [18 June 2004] Seminar by DR. Franceschini about insect-inspired control of micro aircrafts. [28 May 2004] The fist Flying Robots Contest at EPFL is based on blimp plateforms and will take place within the Smartrob contest. [2 February 2004] Seminar about indoor flying robots at Robopoly. [17 December 2003] The fist Flying Robots Contest at EPFL has officially started with 5 teams of 3-4 people. Each team received a subpart of the equipment we developped for the Blimp 2. [16 October 2003] Conference about this project "Bio-inspired Flying Robots", followed by demonstrations at the "espace abstract", Rue de Genève 19, Lausanne. [2-4 May 2003] Portes ouvertes du 150e: démontration interactive du Blimp. Couloir du CE, vers la salle polyvalente de l'EPFL. [11 January 2003] Demonstration at "Robots en ballade" in Pully, Switzerland. [26 July 2001] Demonstration of our models (B, C and GyroRover) and some of Mr. Szymanski (blimp, mouse) in the salle polyvalente EPFL. More recent media coverage can be found on this follow-up project webpage. [18 Mar 2007] Le Temps publishes an article on this project: "Des robots volants qui ont pour modèle la mouche". [20 October 2004] "1er concours de robots volant à l'EPFL", un article de T. Ruef dans modell flugsport. [02 September 2004] "Birth of the Bluetooth Bots", an article by David Pescovitz in TheFeature. [24 April 2004] TV interview of prof. Dario Floreano on TSR1 (Racine) about intelligent robots, among which our Blimp 2b. [3-4 February 2004] TV show (Zig Zag Café) on TSR1 and TV5 about Solar Impulse with a demonstration of our vision-based autonomous wheeled robot (Khepera) and airship (Blimp 2b). [16 October 2003] Broadcast of a short TV report in German about this project in MTW magazine FOCUS. The video clip is available here (third and last subject). [6 July 2003] Article in 24Heures (p.27) about flying robots in our lab: "Des robots dans l'air à l'EPFL". [18 June 2003] Article in Tages-Anzeiger about flying robots in our lab: "Wie Roboter sich das Fliegen beibringen". [June 2003] Description of our lab activities in both Focus and Quark magazines. [8 May 2003] Article in Le Temps (a Swiss newspaper), p.30: "Le Zeppelin est toujours une idée d'avenir, mais en version miniaturisée"
[5 May 2003] Article in Le Temps (a Swiss newspaper), p.28: "L'EPFL, 150 ans au compteur et 25 000 passagers de plus le temps d'un week-end"
[December 2001] Publication of an article on our C4 model (in French and German) in Modell Flugsport & CERVIA. [13 August 2001] Broadcast of a short television report at the news (TJ-TSR, in French) about our indoor slow flyers. The full lenght video clip is available here (27.7MB).